Goa is a favourite of bohemians and travellers who are out to make memories. The state has not been an ideal partying and travel destination for just Indians, but foreigners as well. And, why shouldn’t it be, you get long stretches for beautiful (albeit a little crowded) and some amazing seafood cooked in shack-like restaurants. It would be an understate to say that Goa is one place that never ceases to surprise people. While the sun, sand and the sea are good enough reasons to pack your bags and head to Goa (it’s Goaaa, after all), some of you might need a little more convincing. This is where the excellent adventure sports (and water sports) of Goa comes in the picture. Whether you are looking to jet ski your way into the vacation or go snorkelling to say “Hi” to the marine animals, Goa has you covered. Moreover, almost every beach has safe and certified provisions for adventure sports in Goa, so if the adventure junkie in you is yearning for some adrenaline-pumping experiences, stick with us and read the entire blog. The wind along with water splashes your face as you speed your way across the ocean! 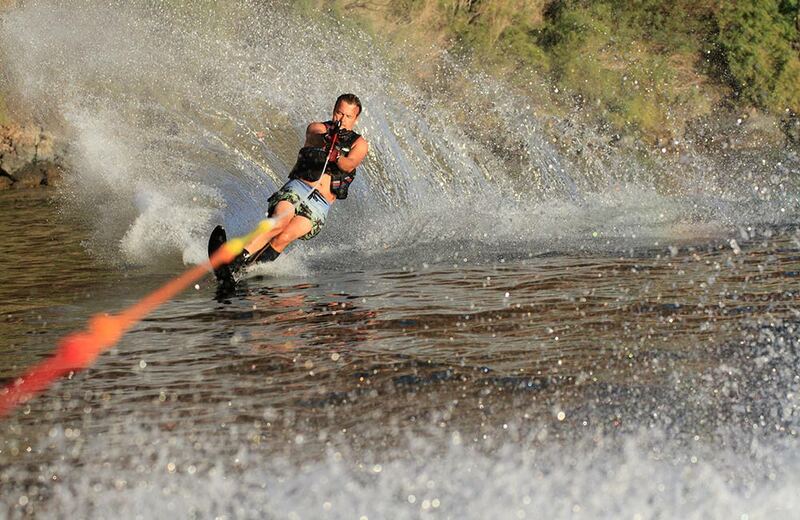 If it sounds like your kind of adventure, try water skiing. A popular choice of water sports in Goa, this one is for all those who can bear some stomach-churning action. Swimming is one thing you should know before you can get on the speedboat. And, if you can brace yourself against 40-60 km/h of speed, then only you should opt for this adventure activity. 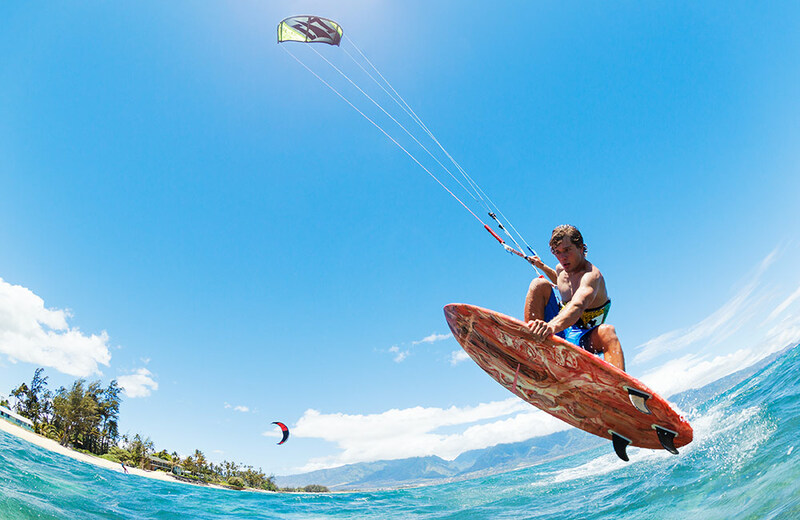 A popular adventure activity in Goa, kite surfing is not for the faint-hearted. This one requires controlling a power kite, which in turn requires you to take proper training, which familiarises you with the manoeuvers to control the kite when you are on the water, speeding ahead or in the sky!. 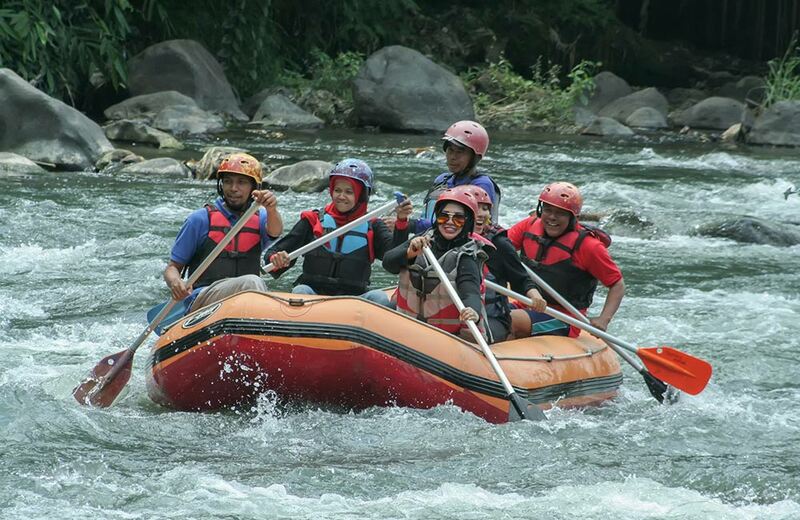 An adventure sport that requires expert supervision, it can only be done by adults. 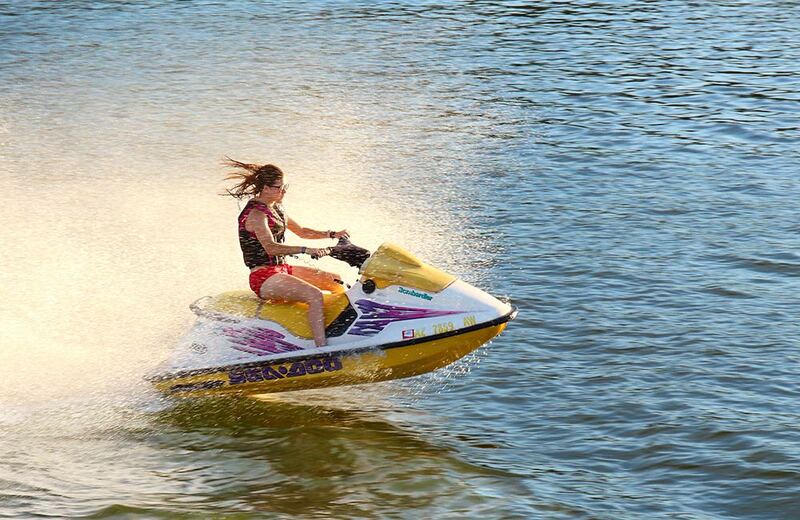 Imagine a combination of jet skiing, wakeboarding and surfing, and you have an idea of what we are talking about. You will have to start in the morning as that is the time when the winds will be in your favour. Of course, you will also have to consider the season when you try out this exciting-as-hell activity. The marine life will truly be a revelation to people who spend their entire life breathing on land. And, if you are mesmerised by this endless and mysterious aquatic life, scuba diving will give your curiosity a level of relief. 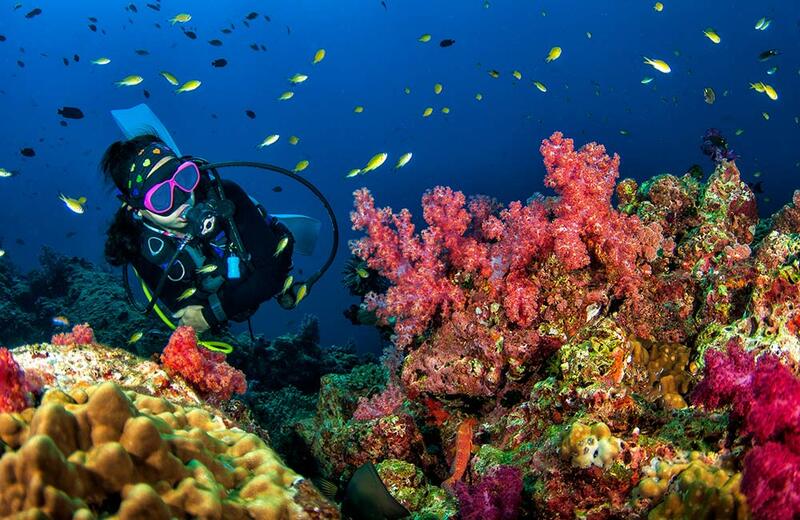 Starting from colourful fish to beautiful coral reefs, you can explore it all once you are underwater. The scuba diving price in Goa is pretty decent, making it worth a try. Sign up for it and you will be able to go to 5 to 10 metres deep in the open ocean. Of course, you will be under expert supervision if you book from the right agency. While white water rafting in Rishikesh is popular worldwide, we urge you to try this famous adventure activity in Goa as well. Given the popularity of other water rides in Goa, people often tend to undermine this exhilarating sport. You can book an entire expedition with your loved ones at the best prices in Goa or join one as an individual. The stretch of white water rafting is usually 10 km long, and it is replete with areas where the flow is fast and current strong. The agency you book your expedition with will provide you with the necessary directions and also the equipment like life jackets and oars. So, if you planning a trip to Goa with your friends and family, this one is not to be missed. 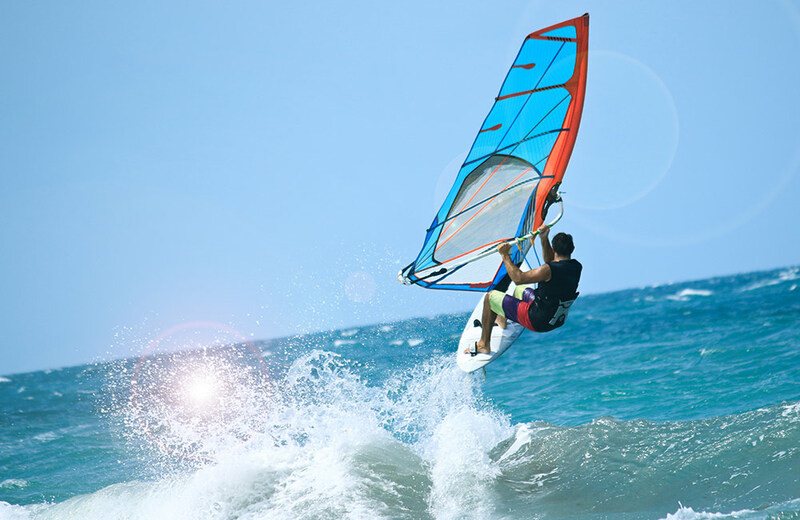 A combination of both surfing and sailing, windsurfing in Goa is another popular watersport. Treated as a moderately difficult activity, this one requires a bit of training. You have to be fit and quick to adjust the sails as per the rapidly changing direction of the wind. And, all the time, you will be at sea on the mightiest of the waves. If you think you can brace such an adventure, you will definitely have a memorable time at windsurfing. A watersport that has recently gained traction on all the popular beaches in Goa, this one is a lot of fun and less of hassle when it comes to training and following instructions. 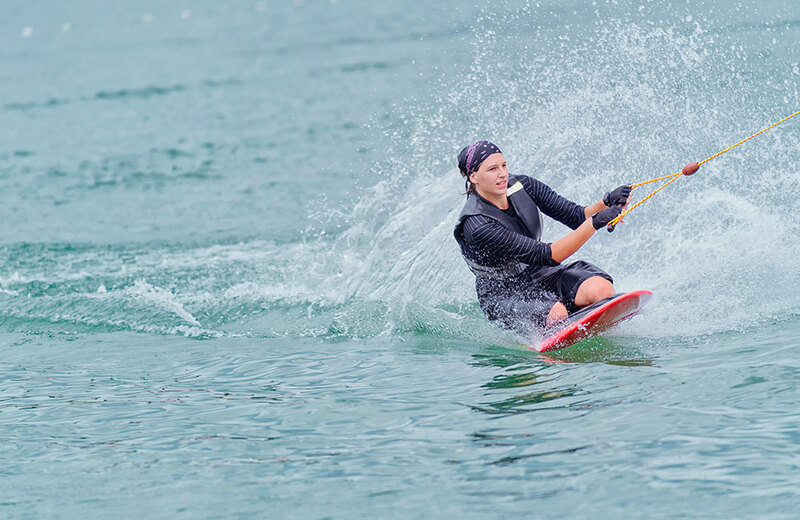 In wakeboarding, you will have to master balancing a board with a single hand as you are pulled forward on the water by a motorboat. Trust us, it only sounds daunting, but in reality is something you don’t want to miss. If you don’t want to tackle the waves standing up, you can go on your knees (pun intended) to make it less daunting. And, this is what is called kneeboarding. You are often required to know these two watersports in order to take up more extreme ones. If after all the adventurous activities, you want to relax and simply soak in the surroundings of Goa, kayaking is an excellent idea. A calm and soothing water activity, this one takes you along the backwaters and lesser-explored parts of Goa, depending on where you book your expedition from. 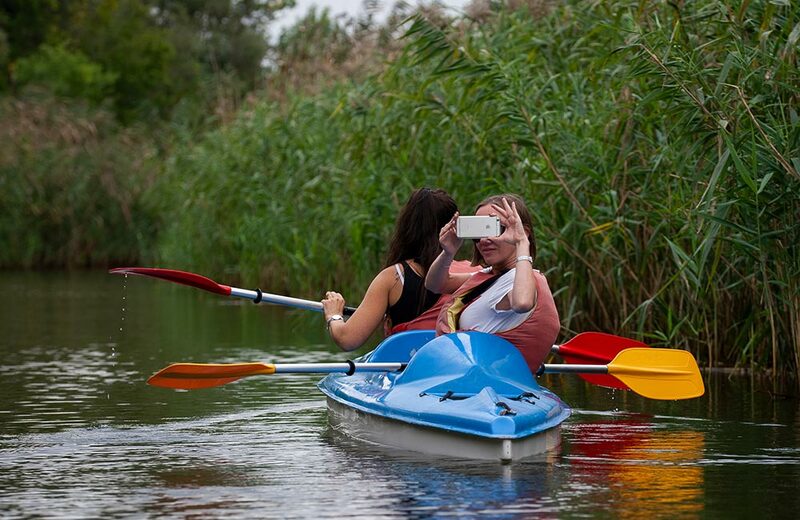 We recommend you try kayaking during the monsoon season as the light drizzle of rain makes it a lot more memorable. Hire a jet scooter, and zoom off to the horizon all Bollywood style! This is what people have an image of when jet skiing is discussed and the reality is more or less the same. Train for a little while, get in control of your water scooter and you are good to go. While the thrill of riding the waves can be enjoyed alone, the fun doubles up when you have your friend, family member or significant other with you. Life jackets are a must, especially if you don’t know how to swim. If you were under the impression that all the fun is centred around North Goa, you are in for a surprise because the water sports in South Goa are equally popular and thrilling. 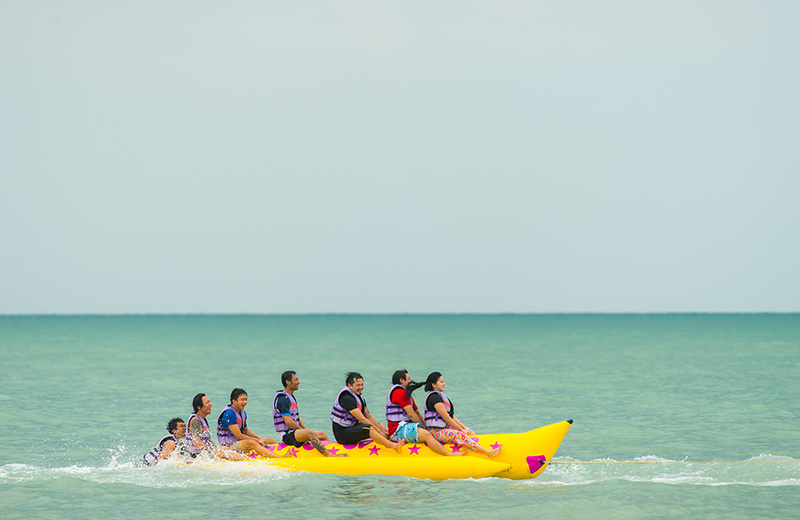 For instance, banana boat rides is one such water-based activity you cannot miss, especially if you are on a vacation with your family and friends. In this watersport, you will be seated on a banana-shaped boat with a group of people. The challenge here would be to move ahead against the ocean waves without flipping over. But, if you do flip over once or twice, it is equally fun. You are flying in the air while the ocean winds grace you! And down below is the endless Arabian Sea. Sounds like the kind of adventure activity you would be up for? 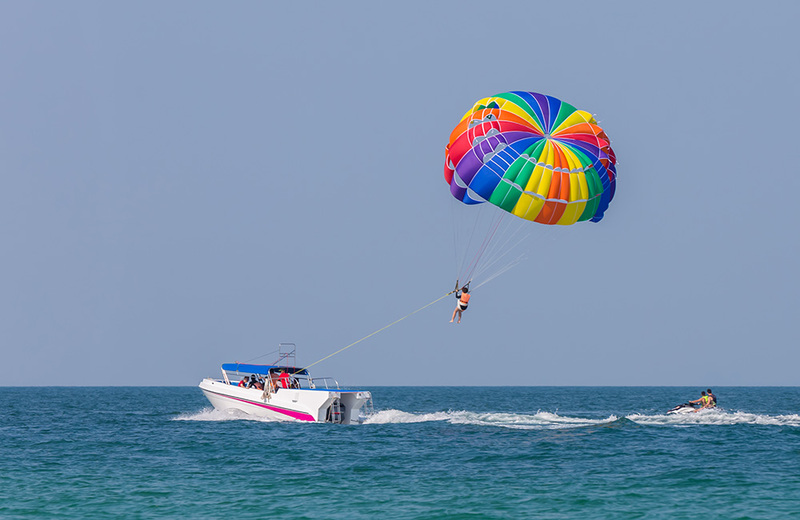 Then parasailing is the watersport in Goa you should definitely try. You can either out or attach your parachute to a winch boat. Today, the latter is the thing people go for because you can straight away land on the winch boat itself. 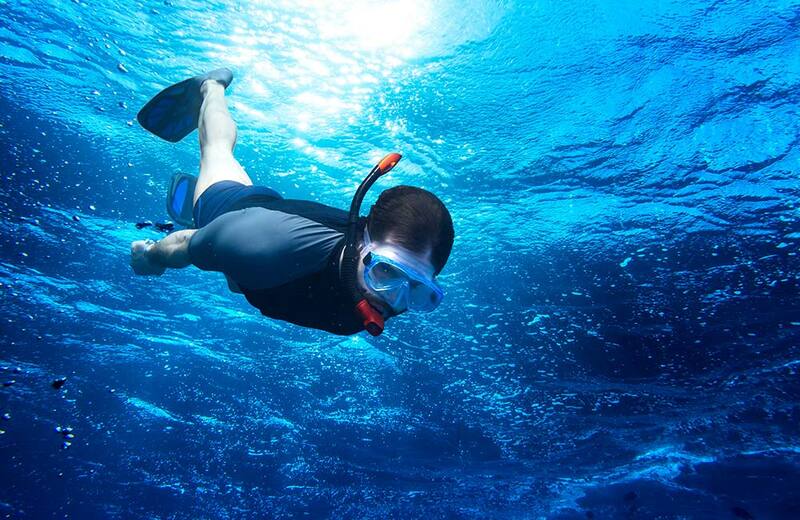 If scuba diving is too much hassle for you, go for snorkelling. Offering almost the same surreal experience of submerging yourself underwater with the marine species, snorkelling is preferred by a lot of tourists who don’t want to train before partaking the adventure. Once you are underwater, you can explore and see for yourself the beauty of the vast ocean. From batfish, snappers and lionfish to the wrecks of ships sunk during the World Wars, you will find everything underwater. If your inquisitive soul is shrieking with joy, we recommend you book your adventure before you plan your trip. Last but certainly not the least, paddleboarding in Goa. It might look like an easy sport, but the sheer act of balancing everything will leave you worn out (and utterly satisfied). It includes having to stand to stand up on a surfboard, holding a paddle in one hand to keep yourself upright against the crashing waves. 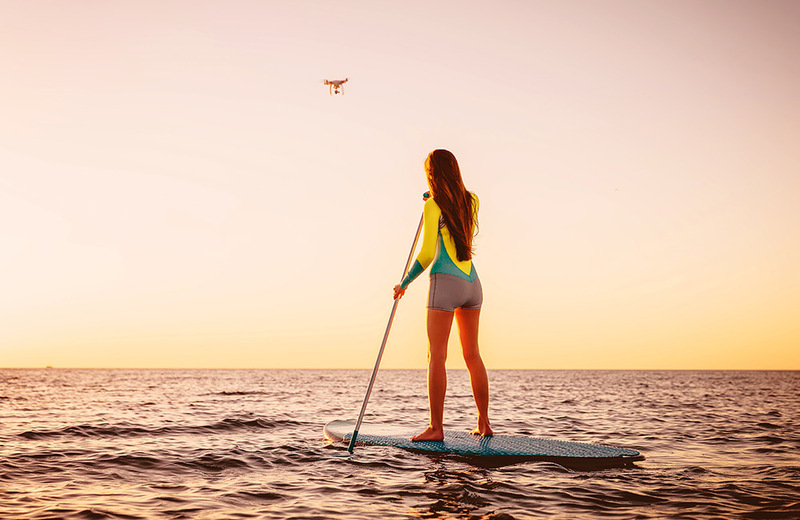 So, if the adventurer and thrill-seeker in you is yearning for something unusual, paddleboarding might just be the adventure sport for you. Don’t forget to sign up with a good agency and also practise for a few days before you embark on this exhilarating activity out in the Arabian Sea. All pumped up for your next adventure trip to Goa? We hope so, because this is not an exhaustive list of activities that you can try when in Goa. Moreover, you even have loads of places to visit in Goa like the beaches we mentioned above and more, Portuguese churches, wildlife sanctuaries and spice plantations, waterfalls and lakes, and what not?! So, all in all, Goa is a place that truly won’t stop surprising you, even if you are visiting it for the nth time.